The origins of solar power can be traced right back to 1839 when French scientist Edmund Becquerel first observed the photovoltaic effect. Fast forward to today and solar power has come a long way. 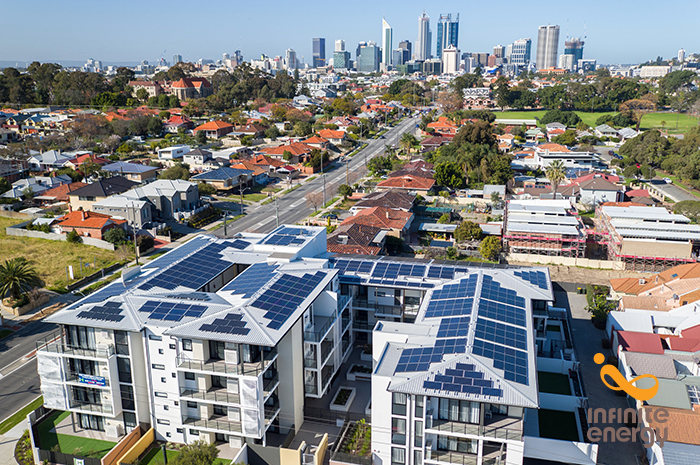 More than 15% of Australian homes are now powered by the sun and this is growing by the day. And its no wonder why – thanks to our high solar irradiance rate, Australia receives some of the most sunshine in the world. This means renewable energy options such as solar offer a real alternative to buying our power from the grid. With the introduction of affordable solar batteries, it’s possible to gain almost complete energy independence from the grid. The ability to power your home or business with an alternative to electricity generated from fossil fuels. An escape from continually rising power prices. The freedom to generate your own electricity on-site. A financial investment which provides a very short payback and high tax free returns. Infinite Energy is a leading installer of residential and commercial solar panels in Australia, with offices in Perth, the South West, Brisbane, Adelaide, Melbourne, and Sydney. Since being founded in 2009, we’ve completed 15,000+ solar PV jobs. For a no pressure, consultative chat about your solar needs, give our friendly sales team a call on 1300 074 669 today.